This DC Power Plug Tip back end is a female jack that can plug to a 4.00x1.70mm connector, such as our Z3, Z4 & Z5 Series DC Power Cables, another end is a special shape male connector that can fit DC input power jacks of a lot of devices. Note: Above list is just a partial list. 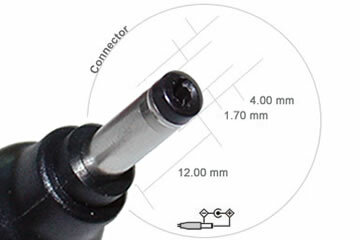 The connector plug tip may actually work for many other devices. New devices & models are coming out everyday and we are unable to list all of them on time. The picture of this connector shows detail dimension of this connector, please compare it with your current connector to make sure it works for you.